Bad Dream: Coma is an adventure game by Desert Fox. The gameplay focuses on solving puzzles by using items found in the game’s world. The game set inside a nightmare, and the hero who gets trapped inside is ready to go to great lengths just to get out. publisher : PlayWay | Forever Entertainment S.A. Published on PC, Bad Dream: Coma is an independent point-n-click adventure from Desert Fox Software. 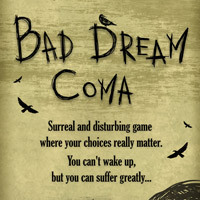 Bad Dream: Coma is the first big production by the studio responsible for small, free games from the series Bad Dream, sub-titled Cyclops, Hospital, and Memories. The plot is filled with mysteries and understatements – it tells a story of a man trapped inside a nightmare. The vision of being stuck there gives the hero the fright of his life. The only thing he desires is to wake up and leave this bizarre world. There is a number of questions with no answers: will he be able to escape? how did he end up there? what is the role of the people he meets there? Many of them will remain without a clear answer, but it is up to the player to reveal the mystery with the use of fragments of information he gathers during the journey. Importantly, the title is non-linear, and the choices the player makes influence the game’s ending (there are a few). Bad Dream: Coma released on PC is a point-n-click adventure title. Gameplay consists in looking for vital items in different locations and then using them in order to solve puzzles and going further. The title features an element that tests your perceptivity, such as pointing differences between two images. During the journey, you will visit eight diverse locations, like a ruined bridge leading to a town, a dark and disturbing forest, a dilapidated graveyard, or an abandoned hospital. The fact that the decisions taken by the player influence the world and the hero himself is also crucial. The consequences are presented by small paintings shown on the character’s status display. It can tell you, for example, that the protagonist’s hands are covered in blood. This is the place which displays three images, allowing you to constantly check which ending the hero is currently targeted. The visuals of Bad Dream: Coma features a pencil sketch style. A scarce palette of colours which, in fact, consists of black, white, and contrasting red, intensify the disturbing atmosphere of the production. The sounds go hand in hand with the graphics. Ascetic, seemingly inconsistent piano sounds combine with the distressing noises of the surroundings – a baby’s cry, the fury of a storm, birds’ croaking, etc.